The use of Facebook as a shopping portal is still in its infancy and marketing managers are still trying to understand how the Facebook platform can provide them with the means of growing the value of their brand(s) together with a highly efficient means of monetizing it. One of the greatest concerns of Marketing Executives during recent years has been to find a way to quantify the ROI of Social Media. The simple metric of tracking the number of “Likes” that can be generated by a brand’s “Page” is widely regarded as being greatly inadequate and many professionals admit to being bewildered in knowing how to transcend beyond this. With 750 million users, Facebook is the largest “residential district” in the world that lacks a strong, vibrant and thriving “commercial district”. On one hand, it is a salesman’s dream and on the other, it is a marketer’s strategic nightmare. At Sortal, our mission is to provide merchants with a rational means of entering into the Facebook community by equipping them with a commercial framework together with a sophisticated marketing toolkit so that they can successfully engage consumers according to the unique culture that exists throughout the Facebook society as a whole. What makes Sortal unique from other similar f-Commerce propositions? The Sortal platform was designed with social networks user behavior as its foundation and with an emphasis in helping merchants to enter the Facebook community according to the unique expectations and requirements of the community. We offer a sophisticated set of marketing tools that are designed to engage the Facebook community and is highly effective in driving the success of a merchant’s Loyalty Reward Program; with the by-product being increased sales and brand value. Each of the key tools have been uniquely designed to entice, engage and energise a fan-base within Facebook and then streamline their ability to create a narrative and share their activities—even if they do not actually shop—with members of their social network. Through this process, new fans are recruited and merchants are then able repeat the cycle and appeal to an ever growing audience. Sortal uses the Magento Open Source platform; which has quickly become the de facto standard eCommerce system and seems poised to dominate their market sector for the foreseeable future. The richness of the Magento eCommerce system provides merchants with a best-in-class architectural framework for managing products and inventories, publishing catalogues and handling transactions according to unique characteristics of each merchant. In addition to this, Magento provides a thriving ecosystem that extends the wealth of additional features at a very low development and maintenance cost. 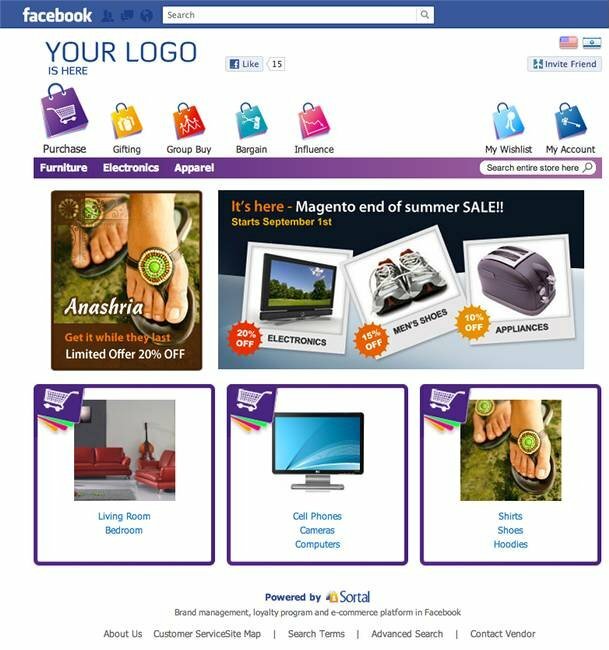 From a Sortal perspective, the combination of Sortal plus Magento means that merchants can publish elegantly branded catalogues to sell any product or service, simultaneously through multiple stores, using a single platform, so that they can perform transactions that are driven by Sortal’s unique set of Facebook marketing tools, within Facebook. In this way, Sortal provides merchants with more than just a “Facebook store” or the number of “Likes” that a brand receives. Merchants love Sortal because it provides them with unprecedented access to social information and a vastly richer means of calculating the ROI of Social Marketing in isolation from their non-social marketing activities, using an array of scenarios and data. Consumers love Sortal because it provides them with an entertaining and personalized Customer Loyalty Program, on a brand-by-brand basis, that cannot be achieved through any other Social Shopping or eCommerce system. Check out Sortal demo store or download your Sortal platform here. You can also take a look at some real-life success stories of how it is used. Ami Meoded is the CEO and Co-Founder of Sortal Commerce. Ami has extensive experience in developing viral marketing models, and is an expert in the fields of customer behavior and unconscious buying decisions. Duncan McTavish is an Account Manager at Satine Interactive DIGITAL MEDIA and is an International eCommerce Specialist that currently resides in London (UK); previously from Vancouver (Canada), Chicago (USA) and Stockholm (Sweden). His background includes over 30 years of experience in retail management, marketing and software development for B2B and B2C market sectors.